Here’s a question for you: Who of us will be able to see the Blessed Trinity? Who of us will be granted that wonderful Beatific Vision in heaven? You remember what Jesus said in the Sermon on the Mountain: Blessed are the pure in heart, for they will see God. Only those whose hearts are pure will ultimately be granted a vision of the Triune God in heaven. Why? Because, as C.S. Lewis says, “only the pure in heart want to [see God].” Thus I am going to take this opportunity, on this Feast of the Blessed Trinity, to say a few words about purity. Let’s begin by considering the Food and Drug Administration (FDA). Ladies and gentlemen, did you know that the Food and Drug Administration has established for a very long list of foods “acceptable levels of filth and extraneous material and foreign matter”? Take peanut butter, for example. When it comes to your peanut butter, the FDA is willing to tolerate up to thirty insect fragments per one hundred grams, up to one rodent hair per one hundred grams, and up to twenty-five milligrams of water-insoluble, inorganic residue per one hundred grams. Mmmm, mmmm good! If you think that’s bad, I’ve got the statistics for what the government will allow in popcorn. You don’t want to know what’s in your popcorn! Now, mes amis, just suppose that there were a hypothetical peanut butter company whose overt aim was to attempt to get as much filth into a jar of peanut butter without exceeding government limits. This company is going to try to put as much extraneous material into its peanut butter without “crossing the line,” so to speak. Well, you may find this hard to believe, but I have actually tracked down a brand of peanut butter which does precisely that. Ladies and gentlemen, I give you Schkeevy Peanut Butter. It’s so schkeevy. Here’s what it says on the label, “Contains highest levels of rodent hair, rat excreta, insect fragments, and other extraneous matter allowed by the FDA.” There are little pictures of insects and rodents on the label. “High in protein and natural fiber.” It says, “Don’t be fooled by imitations. 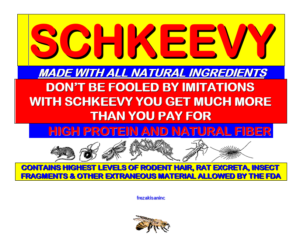 With Schkeevy, you get more than you pay for.” Now you know why they don’t let me do the shopping for Notre Dane Rectory! By the way, after Mass, I’m making peanut butter sandwiches for anyone who is interested. Here is a peanut butter company that is trying to cram as much filth into its product without exceeding the arbitrary levels tolerated by the government. Wouldn’t you rather buy peanut butter from a company with a very different philosophy? Don’t you want a peanut butter whose manufacturer tries as hard as it can to make sure there is as little extraneous matter in its peanut butter as is humanly possible? The point is this: Author and speaker Joshua Harris says that purity is not a line; it is a direction. I repeat: Purity is not a line. It is a direction. Purity does not ask, How close can I get to some arbitrary line without crossing over? Purity has nothing to do with a line. Purity is a direction. Purity poses a different question: Where can I go to encounter as much wholesomeness as I possibly can? By the way (and I’ve told some of you this before), love is a direction, too. My mother, whom I buried a month ago tomorrow, never liked yellow flowers. I like yellow flowers, but Mom didn’t. Because I loved my mother and knew her tastes, I never played games with a line. I never said, for example, Well, if Mom doesn’t like yellow flowers, what about these white daisies with the small yellow centers? What about those flowers with the off-white petals? What about these blue-petaled blossoms with the yellow specks in them? Because I knew my mother did not like yellow flowers, I asked a very different question: Where can I go to find the red roses and the blue violets? Ladies and gentlemen, Class of 2004, are we more concerned with the purity of our peanut butter than with that of our souls? Do we think that God loves us any less than a mother? I mean that all of us ask ourselves questions like these: How much can I do on a date without committing sin? How many impure pictures on the internet can I look at without giving in to temptation? How much of my body can I reveal in public without offending God or causing my neighbor to stumble? How much profanity is tolerable in movies, literature, and TV without getting God all bent out of shape? Whenever we think this way, we treat purity and God’s love as if they were lines. Purity and love are not lines. They are directions. If we know that God frowns on impurity, we should be asking ourselves other questions: What can I do on a date that would make Our Lord smile? What can I view on the internet that will enrich my soul? What kind of clothes can I wear that are modest, tasteful, and appropriate? What TV, literature, and movies can I look at that represent the highest in human culture and divine revelation? As an aside, let me say a word about the true purpose of Catholic education. 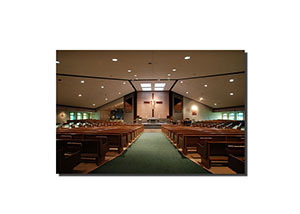 I believe that every Catholic school ought to be the moral equivalent of a fresh air camp. Our job as Catholic educators is not to shield students from all moral evil, as if we could put them inside protective bubbles. That would be impossible. Nor is our mission to rub the noses of our students in as much evil as we can in a misguided attempt to prepare them for “the real world.” That would be cruel. The purpose of Catholic education is to give young people a glimpse, if only for a moment, of the highest and best in human culture and divine revelation—a vision of the stars in an unpolluted sky, a direction in which to move, a taste for heaven. Today, more than ever, Catholic education ought not to be a luxury. It is a necessity. Jesus, if my idea of Catholic education does not accord with yours, have mercy on me, for I must needs die of a broken heart! Remember, Class of 2004, that purity and love are not lines. They are directions. What’s at stake is heaven itself, the Beatific Vision of the Blessed Trinity. Recall that threefold blessing I gave you at your Senior Farewell Mass: May you never be good at being bad. May you soon “cease to love that which will soon cease to exist.” May I get to see…all of you in heaven. Take heed, you Christians. Listen well. Three-Personed source of all beauty? No! Blessed are the pure in heart. C.S. Lewis, The Problem of Pain. From a letter of Saint Bernard of Clairvaux addressed to his brother, quoted in: Abbe Theodore Ratisbonne’s book, St. Bernard of Clairvaux: Oracle of the Twelfth Century (Charlotte: TAN Books, an Imprint of Saint Benedict Press, 1991), p.24.